I suppose most people would consider Charlie Chaplin (born Charles Spencer Chaplin), the world's most famous screen comic, because of this, his films appear in huge numbers on every size of movie film. In fact many home movie companies around the world relied on Chaplin silent comedy films for their main income, especially as copyright in all the early Chaplin comedies from companies like Keystone, Essanay and Mutual, had either not been registered or had long since expired. Charles Spencer Chaplin was born in the UK, on 16th April 1889, at Walworth, London, to Hannah and Charles Chaplin (senior). His father had been a singer, well known to the music hall public of the eighteen eighties. His mother was also a small time artist and singer, originally using the name of Lily Harley. At the time of Charlie's birtth, the two parents were touring their own act. New baby Charlie already had a two-year-old half brother Sydney. Soon penury was forced on the family, either by the desertion or death of his father (dependimg which book one cares to believe!). Certainly with their mother unable to perform on stage any longer, by strain on her voice and/or progressing mental illness the two lads had to fend for themselves earning whatever they could by minor engagements in the music halls and petty theft. An early engagement for Charlie and his brother Sydney was with the Eight Lancashire Lads, a troope of child clog dancers - by now Charlie was about eight years old. Some documentation proves he appeared in a few London theatre productions including "Sherlock Holmes" with William Gillette (in the part of Billy) and "Peter Pan" at The Duke Of York's Theatre in December 1904 (playing one of the wolves). 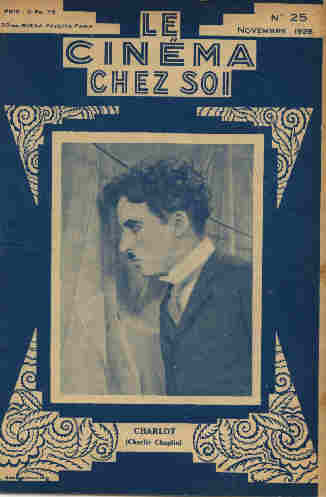 By 1906 when he was seventeen, he had advanced to a solo turn with songs and comedy. Now fate stepped in with a chance that within a few years turned a half-starved working class English teenager into one of the richest and most well known men in the world!! Chaplin's brother Syd had got a job with a touring group - one run by impresario Fred Karno. Luckily he got an audition for his yonger brother, establishing them both in a decent company where working conditions were good, with a management that was well known and respected. Once some more experience had been gained, Fred Karno decided to include Charlie in one of his American touring troopes. This was in the Autumn of 1912. Very soon he had been spotted by Mack Sennett and was earning $125 a week , some three times what he had earnt with Fred Karno and starting in early film comedies .at the Mack Sennett film studios in Hollywood, Los Angeles, California on the West Coast of America. Natural ability, pleasant personality and a driving force to succeed meant rapid progression from Mack Sennett's Keystone films in 1914; to Essanay Films in 1915, to Mutual Films in 1916 and finally to First National in 1918 when finally, around 1919, he formed his own film company (United Artists), with Douglas Fairbanks, D.W. Griffith and Mary Pickford. . The 9.5mm 'home movie' story stops well before then, as Chaplin had already decided that by owning his film product, he could totally control the copyright of his efforts. To be fair, at least he could also enjoy the resulting profits and the rest of his life. Having been ignominiously banned from the USA (his poliical views were perhaps not to the American establishment's liking - nor to an English born low-life being rather richer than well-connected American entrepeneurs). He retired to Switzerland with another younger wife and his family, where he eventually died, at his large and comfortable estate at Corsier-sur-Vevey; aged 88, on December 25th 1977. By then, (despite the American hatred) feted elsewhere as Sir Charles ("Charlie") Spencer Chaplin KBE. One of his well known quotes on life is well worth remembering - "A day without laughter is a day wasted". The 9.5mm gauge being the first real amateur film gauge, was probably also the first to exploit the Chaplin films, although the earliest examples were just short extracts. In fact seldom were the early Chaplin comedies issued full length - the 'two reelers' (up to 20 minutes or so), generally arriving on 9.5mm from Pathéscope in the UK at best as '1 reel' cutdowns. However Pathé-Baby in France did rather better and after the second war French companies Film Office and Hefa did issue more complete versions. Naturally the overseas (French, Spanish etc) 9.5mm prints had the main and inter titles in the appropriate language, although luckily almost all the action is visual, another reason why Chaplin was so popular with people all over the world (including the many immigrants in the USA who often had a poor command of English). As usual, Pathéscope normally retitled the films (and obviously the shorts used different titles) from the original. Naturally the Chaplin films issued on 9.5mm in other countries were titled in their own languages. These lists should help to identify the origin of most 9.5mm Chaplin films that pass through collectors' hands - naturally any errors and omissions would be gratefully accepted. 'waste not, want not' - note Pathéscope have used the same photo 30 years later!! In fact at the end of 1957 Pathéscope thought they had a 'coup' with some of the later Chaplin silent films - "The Pilgrim" / "Pay Day" / "A Day's Pleasure" and "Shoulder Arms" all appeared in 200ft to 2 reel versions, plus various 60ft extracts. The rights had arrived from the E.J.Fancey organisation with whom Pathéscope had done deals for many 9.5mm releases both sound and silent, since the late 1940s. In fact E.J. Fancey thought he had puchased the UK copyright from Germany and proceeded to distribute a Chaplin compilation feature at the cinema. The story goes that Chaplin spotted the E.J. Fancey posters in the West End (London, UK) and swore "I'll sue that b*****d Fancey" and Edwin Fancey returned with "I'll have that b****r Chaplin for slander". In all events E.J. 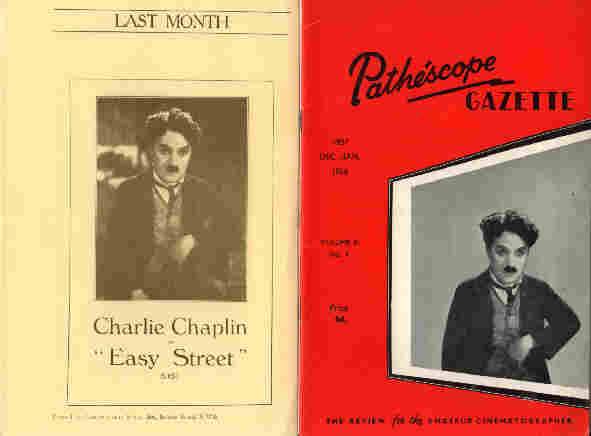 Fancey's cinema Chaplin compilation was hastily withdrawn (and the copyright dispute presumably sorted out of court) whilst Pathéscope had to quietly withdraw their 9.5mm (and by now 8mm) prints. However nothing was ever mentioned in their magazine or in the press and certainly many hundreds of prints of "Shoulder Arms" (and no doubt the other titles) were sold by dealers. Chaplin had realised the danger of losing control of his films and had formed United Artists in 1919 with Mary Pickford, Douglas Fairbanks and D.W. Griffith. From then on he determined to tightly control both the copyright and the physical master material of all his films. The last 9.5mm Chaplin printed films came from Walton Films (WL on the listing below) during the 1960s - these were actually 16mm prints reperforated to 9.5mm and from Novascope Films (NV on the listing below) which were genuine 9.5mm prints produced as triple prints on special 35mm postive stock using original Pathé equipment, produced during the early 1970s. 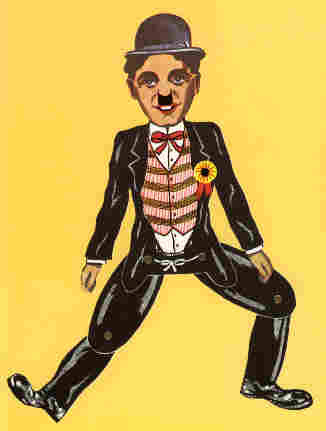 In France Charlie Chaplin was known as Charlot (with similar nicknames in other countries). The French Pathé-Baby 9.5mm house magazine "Le Cinema Chez Soi" featured a front page photo of Charlot for their November 1928 issue with two 4 x 60ft notched releases - "Charlie Chaplin Patine" and "Charlie Chaplin Garcon de Restaurant" (both from "The Rink"). Actually Chaplin films had been launched on 9.5mm in France towards the end of 1925, with extracts from "The Pilgrim". The last 9.5mm Chaplin films in France came from Film Office and Hefa, who both probably carried on providing prints at least till the late 1960s. Popular Chaplin comedy films - all available on 9.5mm! 1 C(DI) D 98 MAN HUNT                                      Silent        6? 1 C(DI) D 99 TO THE RESCUE                                 Silent        6? 1 C(DI) D100 ADVENTURER (THE)                              Silent        6? 1SB(DI) D 74 IN THE BANK                                   Silent        6? 1SB(DI) D 73 BETWEEN SHOWERS                               Silent        6? 1 C(DI) D 96 EASY STREET                                   Silent        6? MUSICAL BARS                ??/??/1? US  1 C(DI) D 97 MUSICAL BARS                                  Silent        6? 1 C(DI) D 95 WAITER (THE)                                  Silent        6? WORK                        21/06/15 US  2 T(PA) 9632 CHARLIE AT WORK                               Sound     *   4? these are all silent films with music/sound effects added. these can't really be included as genuine 9.5mm releases. show he was well connected! But that happens to anyone rich of course!! Well worth a read though! film liists and details, plus other Chaplin biographical works and essay references. 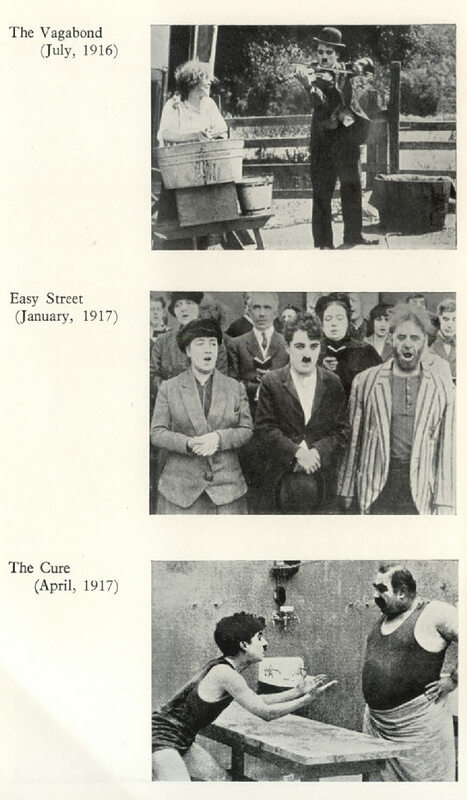 A useful complete list of Chaplin's films with full plot details. Great for identifying retitled films! somewhat to be based on what he wanted people to think of his life rather than the truth! For DVD releases check out the BFI (UK) boxed sets - excellently restored. all from Chaplin's original material, with new music written by Chaplin himself. "The Great Dictator" / "The Gold Rush" / "Limelight" / "A King In New York" / "A Woman of Paris"
try to find the full DVD boxed set "The Chaplin Collection" it includes a 132 minute Chaplin documentary. Any corrections, or additional information will be greatly appreciated!